The 10 verses in the 87th Dashakam of Narayaneeyam are part of the Kuchela episode. This story shows that although a devotee does not ask Krishna for anything, Krishna knows exactly what his devotees needs are. Therefore loving Him unconditionally is the surest way to reach Him. It is believed that reciting the 10 verses of the 87th Dashakam regularly, blesses devotees with excellent wealth and other material benefits and also removes all afflictions and ailments from them. Krishna, His brother Balarama and Sudama were educated at the Saandipani Muni Ashrama which is situated very close to Ujjain in Madhya Pradhesh in India. Their teacher was Rishi Saandeepani. On completion of their education, Krishna and Balarama went to the city of Dwaraka while Sudama stayed back at his own place. Sudama was also called Kuchela. Krishna became the King of Dwaraka but Sudama continued to be poor. He was so poor that his wife and children had to go without food for days together. He had no possibility of becoming wealthy enough to assure his family a comfortable life. One day, Sudama’s wife persuaded him to go to meet his childhood friend Krishna. Sudama certainly wanted to meet his old friend Krishna. That was certainly not with the intention of gaining wealth and prosperity but it was out of love for Him. On the other hand, Sudama’s wife who was not so spiritually evolved, wanted Sudama to meet Krishna only for the sake of wealth. Sudama was worried that wealth could make him proud and arrogant. However, in all his eagerness to meet Krishna, Sudama agreed to his wife’s suggestion and left for Dwaraka. Since he did not want to visit his friend empty handed, he took along with him three handfuls of beaten rice ( அவல்/ ಅವಲಕ್ಕಿ / પૌંઆ / पोहे ) in a cloth, knotted it well and tied the cloth around his waist. As Sudama walked towards Dwaraka, he wondered if Krishna would recognise him at all, let alone receiving him. But he was quite positive that Krishna being a loving and kind hearted king, would receive anybody, particularly a poor person like him. After days of travel, he neared Dwaraka. The city had beautiful houses and the people looked very happy and prosperous. 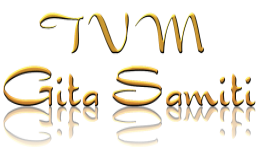 Sudama reached the palace and entered it feeling as if he had entered Vaikuntha. He walked in and he saw Krishna in all His splendour sitting along with His wife Rukmini on a large decorative couch. Their eyes met and Krishna immediately got up and rushed to Sudama to receive him. Krishna embraced Sudama and then held his hand to lead him in. Krishna seated Sudama on His seat. 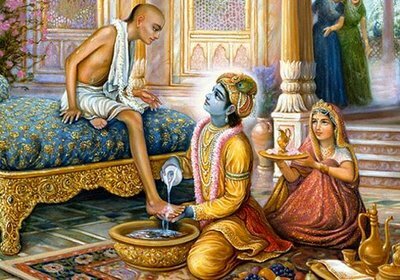 He affectionately washed Sudama’s feet and applied sandal paste to them. He performed ‘Athithi seva’ or the traditional way of honouring a guest. Sudama felt honoured. Krishna then recollected the times they had together when they were young students at the Ashram. Krishna remembered the days they went to collect firewood in the forests and all the fun they had. Sudama was overwhelmed with the love that Krishna the King showered on him and he could hardly speak as he turned highly emotional. Krishna noticed the knotted cloth tied around the waist of Sudama and asked him what it was. He also asked Sudama if he brought something for Him. Sudama felt shy and also embarassed to offer something as simple as beaten rice to a wealthy and powerful King as Krishna. As Sudama tried to hide the knotted piece of cloth, Krishna snatched it and opened it. He took a handful of the beaten rice and ate it happily. As Krishna was about to take the second handful, Rukmini stopped Krishna from doing so. 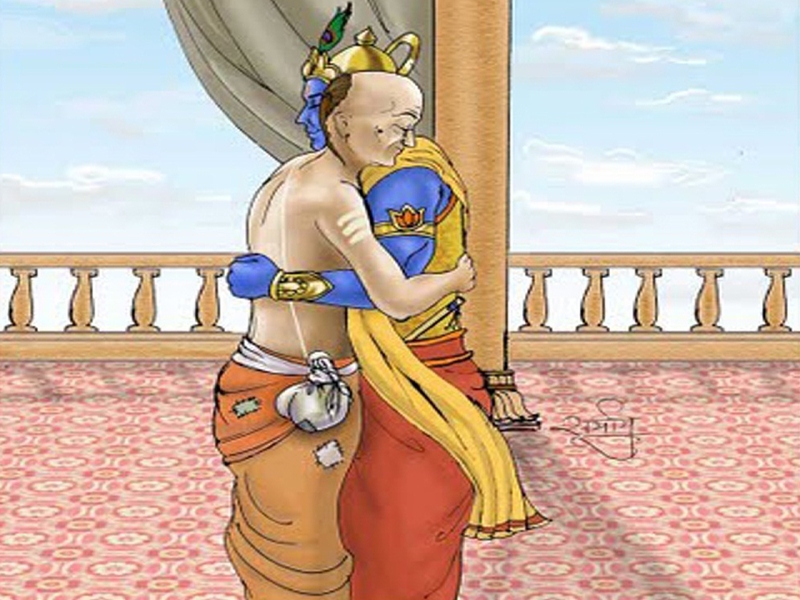 (The reason for this will be explained at the end of this post) Krishna loved beaten rice and he was very happy that His friend had brought some for him.Sudama stayed there at the palace for a night but felt very awkward to ask his friend for help. The next day, Krishna gave him a ceremonious send off and Sudama left for home. All the while, he wondered what he would tell his wife and how they would solve their problem of poverty. But as he arrived at his place, he was shocked to see a huge mansion in the place of his old dilapidated house. As he entered the mansion which was studded with gems, his wife and children came out and ran up to him. They were dressed in the finest of clothes. Sudama’s wife was decked in beautiful jewellery. Sudama was spellbound and he soon realised that his friend Krishna had done everything for him although he was not told anything about his poor financial situation. Note: When Krishna had one handful of Sudama’s offering of beaten rice, all the past negative Karma of Sudama was washed away and he was blessed with extreme wealth. Had Rukmini or Lakshmi the Mother of Fortune not stopped Krishna from eating the second handful and had Krishna eaten it, He would have given all His wealth to Sudama. Such is the Kindness and Grace of Krishna. Those who love Krishna deeply need not tell Him anything. Krishna the Omnipotent, the Omnipresent and the Omniscient, already knows what His devotees need. Absolute love, devotion and surrender before Krishna result in unbelievable miracles. The 87th Dasakam of the Narayaneeyam is the story of the Sudama’s visit to Krishna and the blessings he received from Krishna. It is believed that those who sincerely and regularly chant the 10 verses of this 87th Dashakam, receive immense material benefits such as improvement at work, wealth, other properties and above all, are freed from all kinds of ailments and afflictions.